June 2, 1983, Air Canada flight 797 experienced an in-flight fire. The first hint of smoke odor occurred at 1900 CDT. The crew had thought they had extinguished the fire. At 1907 CDT the smell of smoke returned, and just two minutes later aircraft electrical systems began to fail. The flight crew was able to get the aircraft on the ground, landing just 13 minutes later. 90 seconds later the fire flashed over, killing 23 passengers. February 7, 2006, a UPS DC-8 crew detected a faint odor that smelled like burning wood as they descended from FL330 enroute to Philadelphia. 25 minutes later they touched down on 27R at PHL. The crew stopped the aircraft and the cockpit filled with smoke. 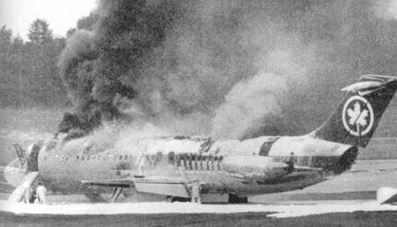 The crew evacuated and the aircraft subsequently became engulfed in flames. September 5, 1996, a FedEx DC-10 crew responded to in-flight smoke. Landing just 18 minutes later inNewburgh, New York, the crew and jumpseaters evacuated the aircraft. The aircraft was destroyed by fire. September 2, 1998, just barely over two years later, a Swissair MD-11 crashed less than 21 minutes after the pilots first noticed an unusual odor in the cockpit. September 3, 2010, a UPS 747-400 crashed while attempting to land in Dubai, UAE. The flight was approximately 120 miles west of Dubai when the crew first declared an emergency. As with any other emergency, surviving an in-flight fire requires sound procedures and regular training to ensure we, the flight crew, follows those procedures. Unfortunately, a fire is one emergency that can kill you even if you do everything right, as the resources traditionally available to us have significant limitations. … test results showed a reduced burn rate for all materials tested as the altitude increased (pressure decreased). The decreased burn rate was nearly linear, slightly greater than a reduced rate of 2% per 1000 feet. Testing of lithium metal and lithium ion batteries, a fire safety area of concern for all transportation modes, showed that altitude had little or no effect on the reaction. However, the time needed to heat the batteries to the point of reaction was increased, because of the reduced burn rate of the fuel supplying the heat, as altitude was increased (pressure reduced). Absent a better solution, depressurization provides one of the best known methods to buy us time, but that must be balanced against the needs of passengers. This is a decision only you can make. Time is what we need to get on the ground. Knowledge of the research, however, might provide some clues as to how and when you might want to plan your descent in the event of a fire. While the fact that a fire might be caused by Lithium batteries does not change most of the recommendations, it can force a situation where the ONLY option is an immediate landing or ditching. It should also be noted that in certain circumstances the fire is associated with what is known as a “pressure pulse”. Essentially, a rapid combustion in an enclosed compartment or container builds up pressure like a bomb and when the walls of that enclosure breach a pressure wave is generated. It is also possible to generate a pressure wave inside the aircraft just through a very rapid combustion. Either way, this pressure pulse can then lead to the failure of the aircraft compartment. As an example, if the fire is in a lower cargo compartment, the protection from the extinguishing agent is predicated on the walls of the compartment maintaining a relatively high concentration of the agent. If a pressure pulse is able to compromise the containment of the extinguishing agent then all of the assumptions for keeping the fire under control are no longer valid. Unfortunately, the cargo compartments were not designed to withstand even a fairly small pressure pulse. It is not clear whether the flight crew would be aware of such an occurrence, although it is possible. Each situation is different, and only the flight crew will be able to determine the best course of action. With that stated, following are offered for your consideration. Are you prepared should you encounter a fire? There are things that we, as pilots, can do that will significantly improve our odds of surviving an in-flight fire. The first thing to remember is that it is essential that you follow our training as closely as possible. It is particularly vital that you become familiar with and follow the checklists in your aircraft as closely as possible. A real fire is not the time to be fumbling with the checklist due to unfamiliarity. Following all the procedures is great, but that does not mean that we cannot learn additional things to make the most of our procedures, such as the lesson above from the FAA studies of the effects of depressurization on fire. Remember the procedures are based on assumptions that are only valid if the assumptions are true. Reading through the brief synopsis list above, a common theme is how little time we have to respond to an in-flight fire. A Canadian Transport Safety Board study found that your chances of surviving an in-flight fire decrease significantly after about 20 minutes, dropping to a very low probability after 35 minutes. At the first indication of a fire, it is vital that we don our full-face mask. What is the first indication? Often it is just the smell of smoke or fumes. Every situation is different, but when reading the accident reports, the risk of waiting for a secondary indication is clear. If you smell fumes, you do not have to wait for visual confirmation or any warning systems. In the event of a fire onboard an aircraft there is not much time. SR111 lost a few minutes trying to confirm the indications before initiating a divert. Did those minutes cost them their lives? Can you get the oxygen mask on within 4 seconds with your eyes closed? Ensure that your mask is clear of fumes? This may require using the Emergency position of the oxygen mask long enough that there is no doubt that it is clear. Fumes can cause vision problems. Fumes can be toxic and may affect our neurological functioning. Both are, obviously, very bad news when you are trying to fly an airplane. Do you know where the Emergency knob for your oxygen mask is? Can you find that knob and operate it blind while wearing the mask? While the location of the control is obvious when you are holding the mask in your hand, finding it with the mask on is a different story. The location (with the mask donned) might surprise you the first time. You do not want that “surprise” when you need to find it in a real emergency. If you have fumes or smoke, your vision may be impaired. Smoke in the eyes can make your eyes close. It is not voluntary. You cannot open them, no matter how hard you try. Being able to don your mask and turning it to the Emergency position completely blind could mean the difference between life and death. When was the last time you tried it? Your next flight might be a good opportunity to try it once or twice. Does your aircraft have a HUD? Studies have shown that it is possible to see the HUD display even with thick smoke in the cockpit. Are you one of those that has resisted using it on a normal basis? A fire would not be the best time to first become accustomed to using a HUD/EFVS. Review the Smoke and Fumes checklist for your aircraft. Could you run the checklist quickly? If you are a Captain, would it work out better if you are PF or PM? Who should be working the radios? Remember that you will be using the intercom to communicate on the flight deck. That adds more work than you might expect. Just like anything else we do, thinking about the scenario in advance can make a big difference. What about the emergency equipment? Can you reach it from your seated position? What if you slide your seat back? What if you get out of your seat, will the oxygen mask hose be long enough to reach the walk-around bottle/mask, fire extinguishers and crash axe? Can you think of scenarios where it might be important to reach these items, or at least know what you can and cannot do in each of these examples? The onboard fire on the UPS B-747 in Dubai burned through oxygen lines leading to the crew oxygen system. Do you know where your pack switches are? Can you find them blindfolded? Do you know how to configure them to keep smoke out of the cockpit if you cannot read a checklist due to smoke? How fast can you pull together the information you need to divert? As indicated in the FAA study, there is a significant advantage to depressurizing and staying high, and fast, until fairly close to the airport. Not only does that take advantage of the depressurized state slowing the fire, it also reduces the amount of time for the fire to flare as you start down. Additionally, your fastest ground speeds are usually available around FL250 to 280. In a freighter this is a no-brainer, but for a passenger aircraft does the risk to the passengers of depressurizing outweigh the risk of the fire or ditching? This is something that only the crew can decide based on the specific circumstances, and, unfortunately, no matter what you decide there will be people who get to spend months discussing and analyzing your choices and how you got it wrong — never mind the fact that you only had seconds to make that decision. Once you are diverting, how close to the airport can you maintain maximum forward speed? There are documented cases where crews slowed to 250 kts approaching 10,000 feet, with an in-flight fire. Those habits die hard. A common debrief item in the simulator exercise is that the crew could have stayed faster, longer. How much longer? In the simulator, find out how long you can maintain Vmo before you need to slow down to make the landing. Obviously the “stable gates” are not a limitation, but you definitely don’t want to have to go-around or go off the end of the runway. Consider using the gear and speed brakes to slow down. Landing gear and doors are pretty tough, and in most jet aircraft, the speed brakes are approved to be used even at maximum operating speeds. They are a lot stronger than flaps or slats. Further, the latter tend to add lift and not all that much drag, and hence are not intended to be used to slow the aircraft, just to allow the aircraft to fly slower. While on the topic of flight controls, there are aspects of modern flight control systems you may not have considered. One of the factors in the UPS B-747 accident in Dubai was that the fire had not only compromised the oxygen system, but also had burned through the barrier protecting the cables that led from the control column to the elevators. On that model B-747 the autopilot is actually fly-by-wire (FBW), so the autopilot still had full authority. There are other types of aircraft that have a similar architecture, or might have separate computers, e.g., flight control computers for a FBW system from the pilot controls are different than the computers that the autopilot uses. Know your airplane, and above just what might be contemplated in your manuals. What about the FMS? Envelope protection features? Will your FMS slow you to 250 kts passing 10,000 feet or some other restriction? Do you know how to bypass that to keep your speed up? What about envelope protection features, can there be a scenario where the system slows you down where it is not absolutely necessary when an active fire is the big risk? Again, know your aircraft! Staying on the topic of knowing your aircraft, how many miles does it take to get from Vmo to approach speed on a 3 degree glideslope? How long from 250 kts to approach speed on the glideslope? How about at maximum takeoff gross weight? You are more likely to encounter many of these fires early in the flight than late, so the probability that you will be doing this at maximum takeoff gross weight is significant. Heavy weights will change the numbers quite a bit. Consider the winds. A little tailwind will make it a lot harder to slow down due to the increase in energy, so be aware! Perhaps, the next time you find yourself with some extra simulator time, it might be worthwhile to try for yourself to see what you can do and still feel safe. Try it with the oxygen mask on. Sorting out that flow when you experience it for real the first time is not conducive to surviving the situation. Consider giving the oxygen mask and intercom a try sometime enroute. Working out the details during a routine cruise flight can provide a significant leg up in the event of a real emergency. What kind of “Smoke Barriers” does your aircraft have? The cockpit door is one such barrier. On cargo aircraft a smoke curtain is another, as is a rigid barrier. When it comes to stopping the smoke, utilize all the barriers you can. One of successes of the FedEx Express Flight 1406 flight crew was attributed to their ability to keep a smoke barrier (cockpit door closed) in place and, consequently, their flight deck relatively free from smoke until after landing. Passengers utilizing a mixed flow of oxygen have few options, another factor to consider. When you get settled in your seat, take a moment to close your eyes and locate the things you need, in order to exit the aircraft: window latch, crank, inertia reel door, etc. When the UPS flight into PHL touched down, inertia forced the smoke into the front of the aircraft, and the flight crew was blinded by the smoke. UPS Capt. Jess Grigg, at that time a First Officer and pilot flying, said that he was focused on getting out of the aircraft, and eliminating things that might impede him, so he released his seat belt and tore off his oxygen mask, then couldn’t find the door for the escape reel. He managed to open his window, and stuck his head out to get some air, but still couldn’t find his escape reel. They were able to escape the aircraft when the S/O found the 1L door, and was able to open it. He now advises crewmembers to check the location with their eyes closed. If you assume an RTO on every takeoff, and a missed approach prior to every landing, you are more prepared in the event those options become reality. Shouldn’t you apply the same proactive approach to a smoke/fire/fumes event? Of all the non-normal events a pilot might face in his/her career, a smoke/fire/fumes event is the least forgiving. Your actions have to be correct the first time. This entry was posted in Safety and tagged Malaysia Airlines Flight 370 Airline Safety Investigators Shem Malmquist Accident fire aircraft UPS 6 Valuejet Air Canada. Bookmark the permalink.